The Justice Institute of British Columbia Foundation has awarded the WorkSafeBC chaired BC First Responders Mental Health Committee with the Dr. Joseph H. Cohen Award in recognition of its outstanding work to increase awareness of and support for positive mental health among first responders. The Award, established in 1998 to honour a founding Governor of JIBC, recognizes a passionate desire to help others and in doing so, provide leadership in the pursuit of public safety. “First responders experience traumas and stressors at work that are unlike those seen in most other occupations, and research has shown that these workers are at higher risk of mental health injuries,” says Trudi Rondou, Senior Manager of Industry and Labour Services with WorkSafeBC. 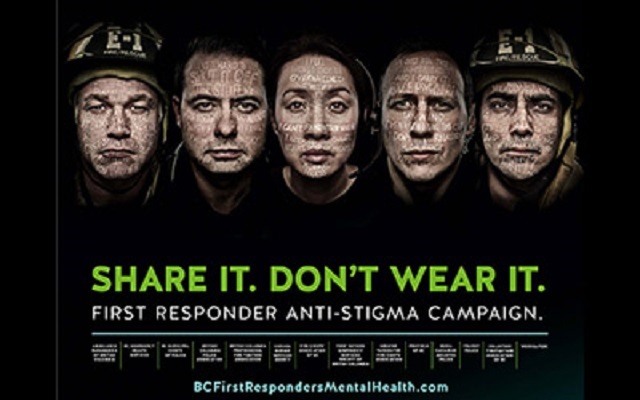 Established in 2015, the BC First Responders Mental Health Committee is as a multi-agency group that works collaboratively to provide cross-organizational leadership and recommend practices that promote positive mental health for first responders across the British Colombia. Members of the Committee include both labour and management representatives from First Nations emergency services as well as the RCMP, Canada Border Services Agency and municipal and transit police, and fire, ambulance and emergency health services from across the province. Another priority was tackling the stigma that still exists in many first responder organizations. To that end, the “Share It. Don’t Wear It.” anti-stigma campaign was created. Members of the Committee were also pivotal in having Post-Traumatic Stress Disorder and other mental health disorders included in the list of presumptive conditions associated with frontline responder work within the Worker’s Compensation Act. The BC Government has showcased the work of the Committee across Canada and its work is now being duplicated in other provinces.